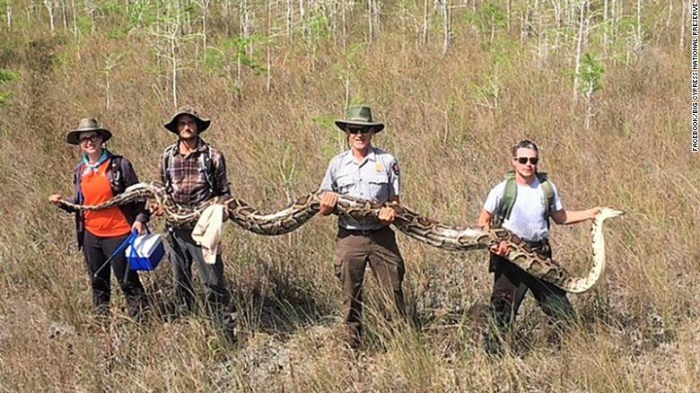 The snake is the largest python ever removed from Big Cypress National Preserve, a 729,000-acre expanse of swampland west of Miami in South Florida, according to a statement Friday on the preserve's Facebook page. Still, this latest find is impressive. Big Cypress' rangers credit research and new tracking technology with making it possible. "Using male pythons with radio transmitters allows the team to track the male to locate breeding females," their statement says. "The team not only removes the invasive snakes, but collects data for research, develops new removal tools and learns how the pythons are using the Preserve."